The year after our largest field, we had our smallest - just 15 entrants - after three pre-registrants bailed. I had thought we were due for our largest field ever with Nick Markevich flying in from CA, Andrew Cummins from the UK, Ken Nied from KS, Jim Eliason from IA, and Tom Dworschak from GA but it was not to be as D-Day fell below the subsistance level of 16 for the first time. But neither the reduced field or the presence of the Euro gamers across the hall kept us from enjoying hitting the beaches again and again with spirited and highly competitive games. Parity has indeed come to Breakout: Normandy. Not only did we have our sixth different champion in as many years, but the hierarchy of top players is not only growing larger, but changing. Designer Don Greenwood posted his first losing tournament record at 2-3 and was joined in the losing bracket by another ex-champ, Bryan Eshleman, with the same record. They wrere joined by Michael Kaye who went 4-0 with the Allies in 2002 only to reverse that ledger this year and go winless in four tries against Hitler's Fortress Europa. And all this despite the absence of such past stalwarts as Alan Applebaum, Jim Doughan, Marvin Birnbaum and Mark Gutfreund. Instead, Ken Nied and Dennis Nicholson won their first BKN wood, as did the champ. Dave Wong went 4-0 to take the crown. Normally, D-Day is a five-round swiss and the last man standing must still survive a challenge from a 3-1 player in round 5. However, Dave had informed me before the tournament that he could stay for only four rounds due to a prior engagement on Sunday. Inasmuch as he is due to ship out for a rotation in Iraq I told him that if he was the last man standing after four rounds, that was good enough for me and we'd crown him the champ. Anyway you cut it, 4-0 beats 4-1. There was some grumbling about this, but I should stress that Dave never asked for special consideration and that, as it turned out, he would have won anyway on tie-breakers even had he played a fifth round and lost to either of the two 4-1 players since strength of schedule was the first tie-breaker and he would have still edged all other 4-1 players in that category. Moreover, Dave won with style - going 3-0 with the Allies and never accepting a supply handicap for a side preference in any game in a year when supply bids reached their highest level ever all around him. Rest assurred, the championship was fairly won and no asterisk is needed. The Germans won 19 of 34 games for a winning percentage of 55%, down from 2002's 59%. Despite five games being played without a bid and several others with only nominal bids for side preferences, bidding rose to new levels - topping out at 21.7. This compares to 9.5 in 2000, 13.0 in 2001, and 17.6 last year. Two players, Ken and David, preferred the Allies and consequently brought down the overall bids significantly. Subtracting their games, the average bid rose to 27.8. The highest bid belonged to Jim Eliason who gave up 50 against Scott Nolan for the Germans but still won. Although things were generally looking up for the Allies in 2003, you wouldn't get that impression from Michael Kaye or Nick Markevich. The latter posted the quickest loss of the tournament when his Omaha forces were entirely wiped out on June 6th! A stuffed invasion, a bombardment, a weather change and an assault did the trick as the opening scenes of Saving Private Ryan undoubtedly played through Nick's mind. My own round 5 invasion didn't fare much better as I endured a dice cold streak of epic proportions for the first two days that left my boys still pinned down on Omaha on the 9th. And that's pretty much how my weekend went except for an opening round match with Andrew Cummins in which fate smiled on me and frowned on Andrew's dice as I gave him his only loss of the weekend. Although, despite frigid dice he made a strong comeback and his Allies actually had a dice roll for the win on the 12th but came up short. The other spoiler was Jim Eliason, the defending WBC champ who is on quite a roll. His Allies handed Tom Dworschak his only loss of the weekend, but then promptly lost his last pair to Dave Wong and Andrew Cummins to start a streak of another sort. Perhaps the real highlight was the overall balance of the field. Despite my own travails, everyone seemed at risk in every match. Ken Nied and Dennis Nicholson posted their first winning records in BKN tournament play and went home with wood for the first time. 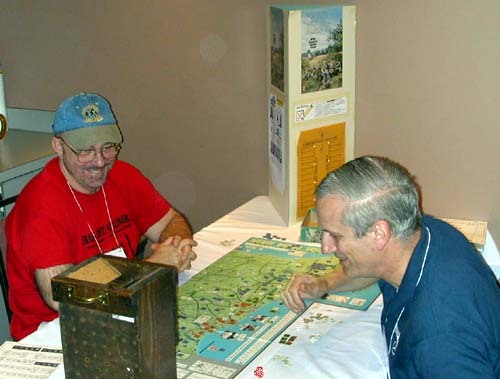 But I'll quote Henry Jones (shown above at left with michael Kaye) for proof positive "Despite going 2-3, I believe that this is actually the closest that I have ever come to winning it all and going 5-0. And I also think that I played the best five games in a row ever. All five of my games were "grinders" and went at least six impulses into the 12th. I had a chance to win every game right up until the end. The two that I won were ones that I snatched from the jaws of defeat, and with probably a half dozen reversed dice rolls I would have won the other three. Oddly, my first game with David Wong came down to his needing to roll up by 1 to stick in St Lo to give him the necessary 9.6 on the final impulse of the game and in my game with Phil Barcafer I needed to do exactly the same thing, but failed when the last roll was 6-5 his favor on impulse 6, and I ended-up with 9.5. It was great fun and "maybe next year." Had that last 6-5 dice roll been reversed, Henry would have ended with a winning record and 6th place. Can't get much closer than that. And so it goes for another year as we all contemplate what might have been had that one key dice roll been reversed. See you in August.